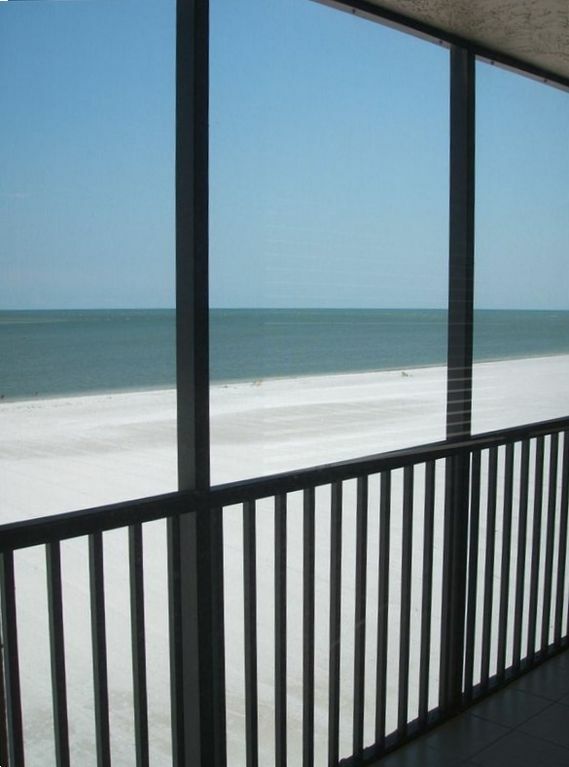 This beautiful condo is located directly on the white sand beach! Brand new kitchen!!!... all new cabinets, all new stainless steel appliances, granite countertops and backsplash! Check out the pictures... New breakfast bar!! The master bedroom has a king-size bed, private bath, walk-in closet, cable/color TV with DVD player and remote, and private entrance to screened-in porch. The screened-in porch looks out over the beach, and beautiful water, just perfect for watching the wildlife, including the dolphins! The second bedroom has two twin-size beds, a private bath, and closets. The living room has a soft yellow leather sofa, leather recliner and swivel chair, sliding door to the screened-in porch, and cable/color plasma TV with VCR/DVD and remote. The dining room has glass table to seat 4. The separate eat-in kitchen has all brand new appliances every kitchen could want. New cabinets and granite countertops! We have included everything you need such as linens, beach chairs, and all the kitchen dishes and utensils. Just bring your family, friends and enjoy!!! I love owning my properties on Fort Myers Beach!!! This beach is the best blend of everything...easy going, relaxing, fun, exciting and peaceful..I love it!! I hope you have an opportunity to experience our little 'peace' of paradise.. The south end of the island as it is quiet, residential and more family oriented. We are across from beautiful Lover's Key. We get to watch all the boats go by and watch the dolphins play right out in front of our condo!!! The south end location allows us to get on/off the island without fighting all the heavy traffic on the north side. I love sitting on the screened lanai in my reclining chair watching the ocean's gentle tide, the dolphins and birds!! The secondary bath is suitable for most wheelchairs and walkers. The shower has a small 3 inch rise to cross over. There are grip bars that are drilled in to the wall. No suction cups!! Pool and beach towels are not provided. There are some beach toys. This was a wonderful place. Everything in the condo was just as pictured. I would recommend to anyone looking for a nice quiet getaway with family or friends. Thank you for taking the time to review! I am so pleased you enjoyed the condo and that it met all your expectations! I agree, it is relaxing and on the best part of the beach! Please come again. Great location on the water ! Great location on the water !! Facilities are clean !! 2nd bedroom needs better beds ! Head boards were not connected ! Enjoyed the views and general comfort of the condo. Love Carlos Point condos and beach! I’m glad you enjoyed your stay. Please come again! Thank you! Loved the view and the beach! The condo looked lovely. It was very clean and the colors were soothing. My husband found the furniture uncomfortable even though it was very stylish. We are used to recliners. The condo was wonderful with a few minor exceptions outside of Julia's control. The smell of smoke from a nearby lanai was evident on several occasions, and another neighbor had long and loud telephone conversations on her lanai. The overall stay was terrific. Thank you for taking the time to write a review. This building is absolutely a non smoking property! I wish I had known about this to report to management and it would have been resolved. I am so sorry. The yellow leather chair in the living room is a recliner. This is detailed in the description on the website. I am sorry you didn’t know. Loved the condo. Spacious beautifully furnished. Towels and kitchen well stocked with everything you would need although we ate out most of the time. Ocean front and great views. It was a long way to get to the beach so you must be able to do some walking - the beach also has lots of shells so barefoot not possible and there was a good deal of seaweed on beach and in water when we were there. Had a problem with cable for TV but with a call to our contact that was addressed and resolved. Traffic on the road thru Ft Myers is awful so we only went to the north end of the island twice - did not feel like spending vacation sitting in traffic but there are some really good restaurants in a little shopping center right down the road - Santini plaza I think - South Beach Grill and Castaways are great and several other close by or going towards Bonita. Overall a nice relaxing vacation - I would highly recommend this condo. Thanks! Thank you for your nice detailed review! Glad you enjoyed your stay. Good location; beautiful updated kitchen; friendly greeter; need larger table in lanai. All rates shown are STARTING rates for that time frame. Holidays and number of guests may increase the rate for that particular time frame. Damage deposits are refundable and start at 400.00. Please add a 125.00 exit clean fee to your amount.